R.S.V.P. to the most riotous wedding of the year…. But even though Meg knows that breaking up her best friend’s wedding is the right thing to do, no one else seems to agree. Faster than Lucy can say “I don’t”, Meg becomes the most hated woman in town—a town she’s stuck in with a dead car, an empty wallet, and a very angry bridegroom. Broke, stranded, and without her famous parents at her back, Meg is sure she can survive on her own wits. What’s the worst that can happen? Lose her heart to the one and only Mr. Irresistible? Not likely. Not likely at all. 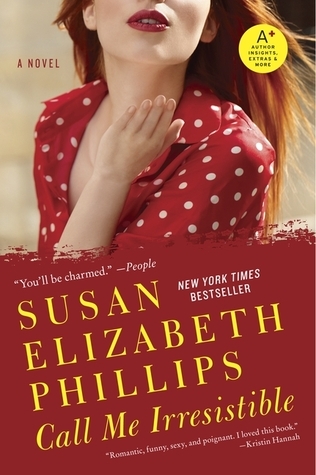 Call Me Irresistible is the book Susan Elizabeth Phillips’s readers and listeners have long awaited. Ted, better known as “little Teddy”, the nine-year-old heartbreak kid from Phillips’s first best seller, Fancy Pants, and as “young Teddy,” the hunky new college graduate in Lady Be Good, is all grown up now—along with Lucy from First Lady and Meg from What I Did for Love. They’re ready to take center stage in a saucy, funny, and highly addictive tale fans will love.